As the economy cycles, it seems to me that so our dining habits evolve. In times of economic boom, a leisurely lunch with plenty of wine and convivial conversation is in fashion. And, when the economy is depressed, it’s all about leaving your jacket on your chair while you pop out to grab a sandwich to eat at your desk. While no one is quite sure what’s happening in the world and more specifically in pre-Brexit Britain it’s perhaps the perfect moment for the Quick Lunch where you can enjoy dining out at lunchtime in a way that doesn’t mean you come back to the office to find a P45 on your desk. 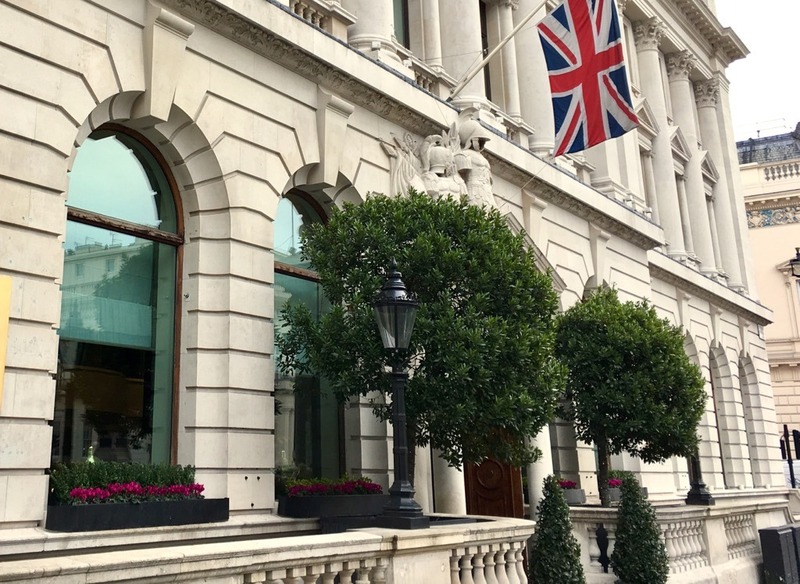 The Balcon, the pretty and classic brasserie at Sofitel London St James has just introduced their quick lunch – an excellent value set lunch menu which will arrive quickly but which, should you choose to do so, is actually worth lingering over. 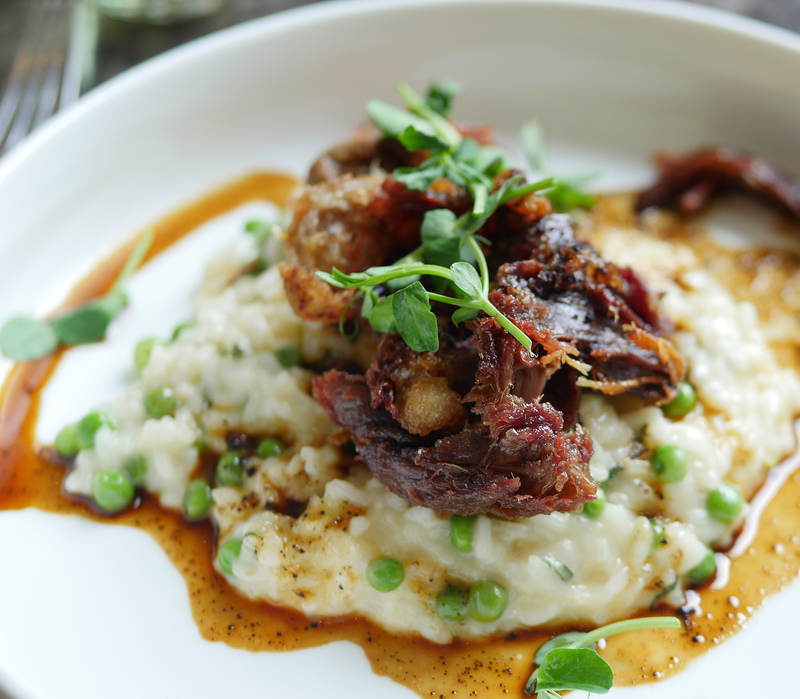 For £30 you’ll get three courses and a glass of wine (it’s £21 for two courses and no wine or £25 for three). And, there are three choices for every course – with an interesting veggie option on the menu as one of the three on the set lunch menu. I popped along to try it out, along with the peskytarian Hedonist and decided it would be interesting to compare the two menus. Sometimes the set menu just ends up feeling a little ‘mean’ by comparison to the à la carte, I wanted to check that was not the case here. 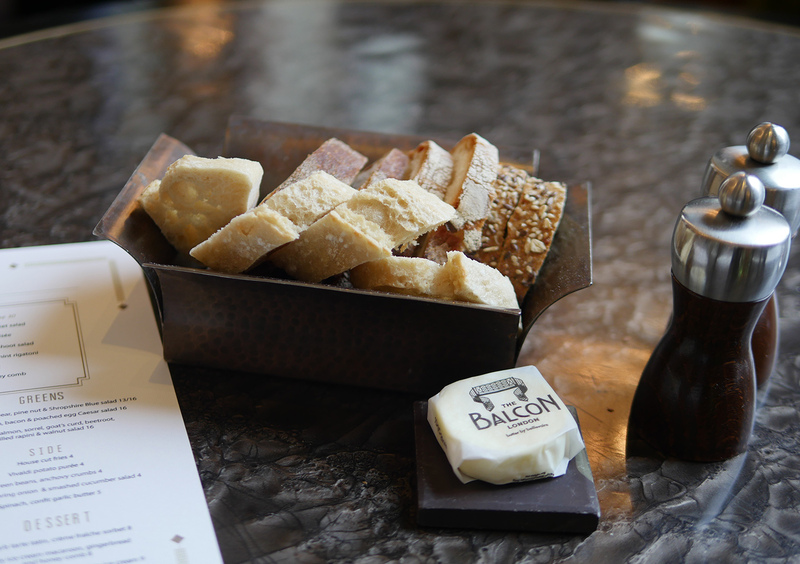 Of course, a basket of freshly baked bread, while we picked our food, was perfect. 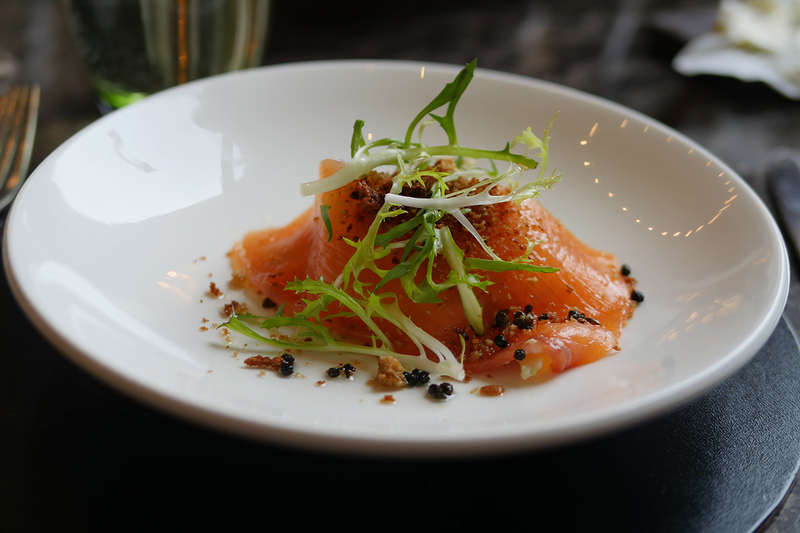 Smoked salmon, celeriac remoulade capers and frisée is a classic brasserie starter. The remoulade was nicely mustardy with just the right amount of kick and the smoked salmon was good quality and full of flavour. 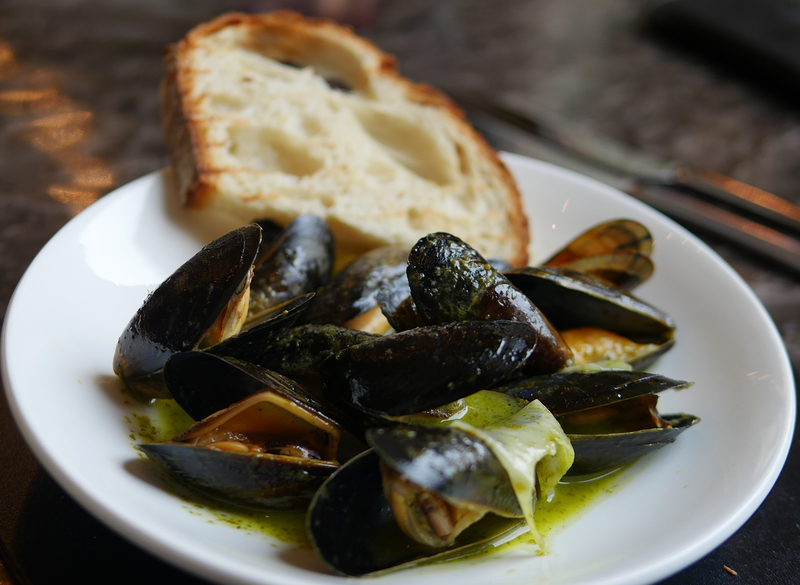 The à la carte alternative we picked was mussels with charred leeks, wild garlic butter and sourdough toast, a light yet substantial start to the meal. 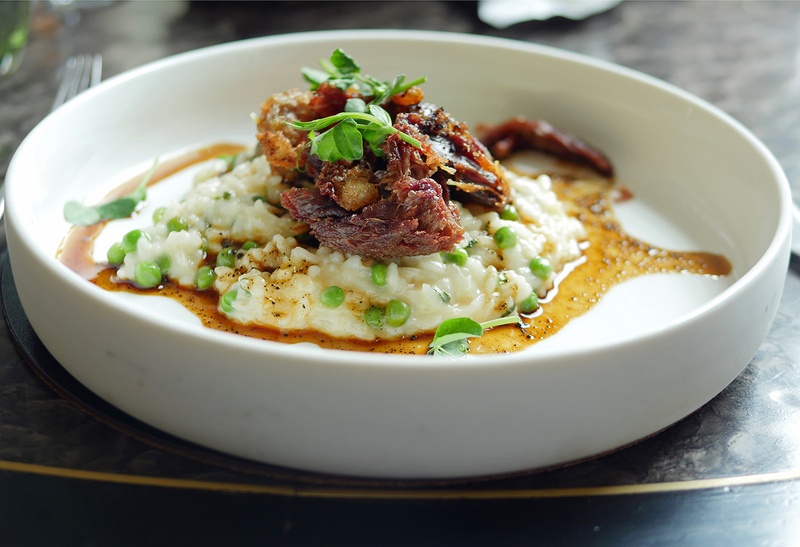 Next up for me was confit duck, another brasserie classic, though pimped up a little by the addition of an apple and pea risotto and truffle jus. The perfect comfort dish on a wet early summer day, I really enjoyed the mix of flavours and the beautifully cooked confit duck though I confess a bad cold or hayfever meant I couldn’t pick out the truffle. The à la carte skate wing meunière with globe artichoke and sauce soubise looked immaculate. Sauce soubise is a caramelised onion mixture in a bechamel base while meunière refers to the skate having been dredged in flour before being pan-fried. A heavier touch could have had disastrous results but instead, the result was a stunning and perfectly cooked piece of fish. With a couple of side dishes of spinach with confit garlic butter and fries, we had more than enough for lunch but went on to explore the dessert menu. 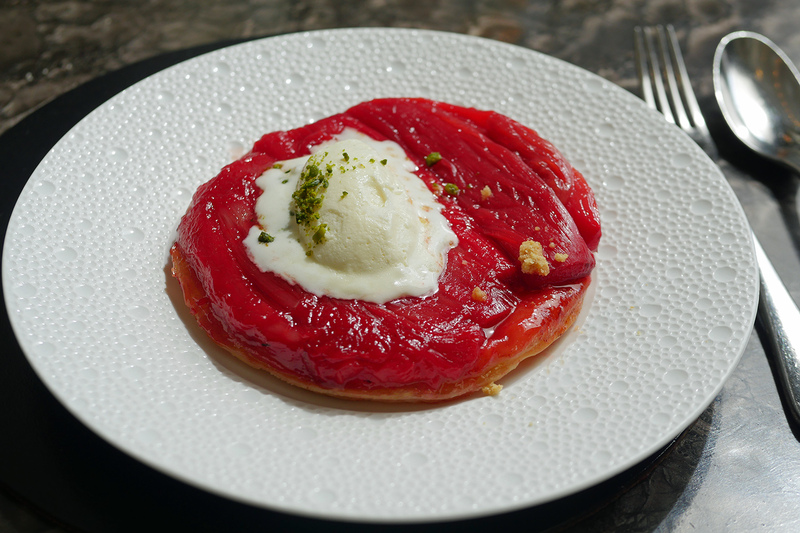 For me, rhubarb Tarte Tatin with crème fraîche sorbet. While I’m not sure I’d call something made with any kind of dairy product a sorbet, whatever you call it, the ice was quite delicious. I was just a little disappointed by the Tarte Tatin which didn’t have the requisite stickiness and caramelisation to make me happy. 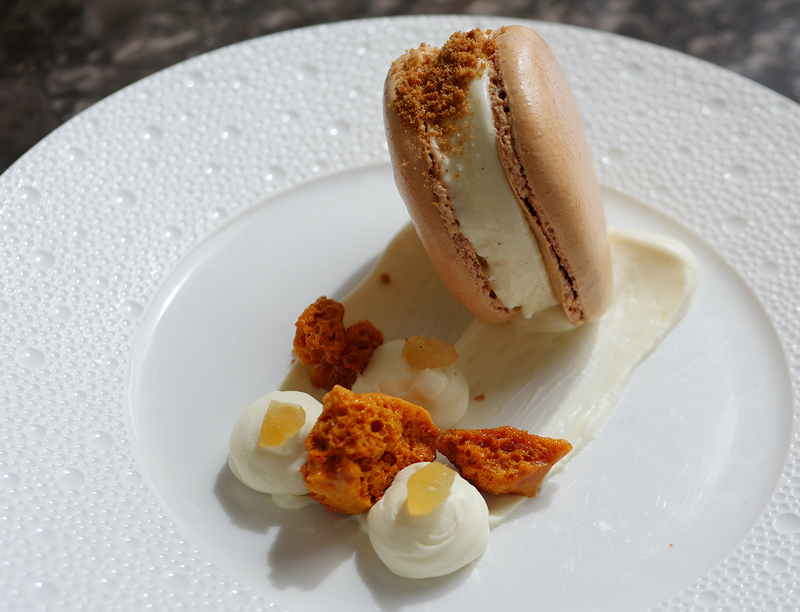 Meanwhile, the peskytarian feasted on a beautiful honey ice cream macaroon with gingerbread and honeycomb which happens to be on both menus. We left The Balcon feeling completely full and very happy. The Quick Lunch is available from 12 midday to 4 pm which means you could enjoy it as an early pre-theatre if you prefer to dine without a rush. Yum! The food looks delicious! Especially that Macaroon!